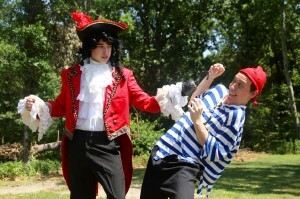 Jeffrey Redwanowski, of Gloucester Township, stars in the title role of Peter Pan. Audiences will travel to Neverland when the boy who never grows up soars onto Mainstage Center for the Art’s stage, July 13 through July 15. “Smee is a really fun character to play. I like participating in all the slap stick,” Schneider said. “It brings me back to when I played the lion in the Wizard of Oz in seventh grade. I’m also enjoying working with the cast and our director, Francine Odri. She comes up with really great ideas and is helping me develop the character. “Peter Pan” is sponsored by Precision Power Wash. Mainstage Center for the Arts’ Children’s Theatre is sponsored by McDonald’s of Hurfville and Blackwood, while the Summer Stage Program is sponsored by AP Construction, Inc; E Consult Solutions; and Investors Bank.